When I went to Londonthorpe to look at the winter buds, I noticed how well lichens had already established on some of the ash trees. These are often overlooked but well worth further investigation, especially if you have a little hand lens to help you out! Definitive identification often involves recourse to complex keys involving chemical tests and microscope work. But don’t let that put you off, the more common species are often identifiable using a simple guide such as the ones produced by the FSC. These show you some of the species you often encounter along with the places you are likely to find them. For example, all three species shown below are found on the ‘Lichens on twigs’ laminated sheet. Lichens are quite unusual in that they are a symbiosis between a fungi and an algae which are in entirely separate kingdoms – the plant and the fungi. They grow on trees, on stone, on sawn wood and bricks and even at the edge of the pavement where feet rarely tread. A common myth is that lichens only grow where the air is clean. Whilst it is true that many species are very sensitive and can be used to indicate the quality of the air, there are also species which are quite tolerant of poor air quality and will thrive in fairly grim conditions. This is evidenced by the number of lichens you can find on trees in the busy London parks. All three of the species described below are fairly tolerant of nitrogen and acid pollution so we can’t use them to make any great claims about the cleanliness of Grantham! These are common species and are often the first to colonise new trees, especially smooth barked species such as the ash. There is lots of terminology associated with lichens – the Natural History museum website has a good glossary. I will introduce a few of the key terms here which we can hopefully expand on with different species in a later post! Lichens can be categorised as crusteose, those which form a crust upon a surface, foliose which are leafy in nature and fruticose which you could describe as shrubby. The three below show examples of crusteose and foliose species. I will try to add a fruticose specimen in a later post! The xanthoria genus of lichens may be the ones you are most familiar with – you can find them in a variety of habitats and they are quite common. 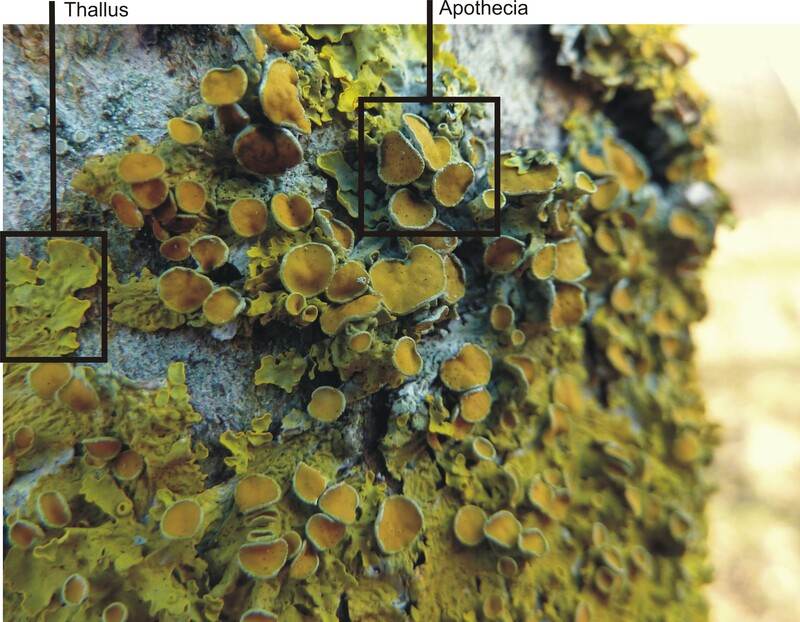 This species, Xanthoria parietina, is a foliose lichen and is a good model on which to show the difference between the main body of the lichen, the thallus, and the fruiting bodies, the apothecia. The fruiting bodies in this species are of the ‘jam tart’ variety, named because of their shape. 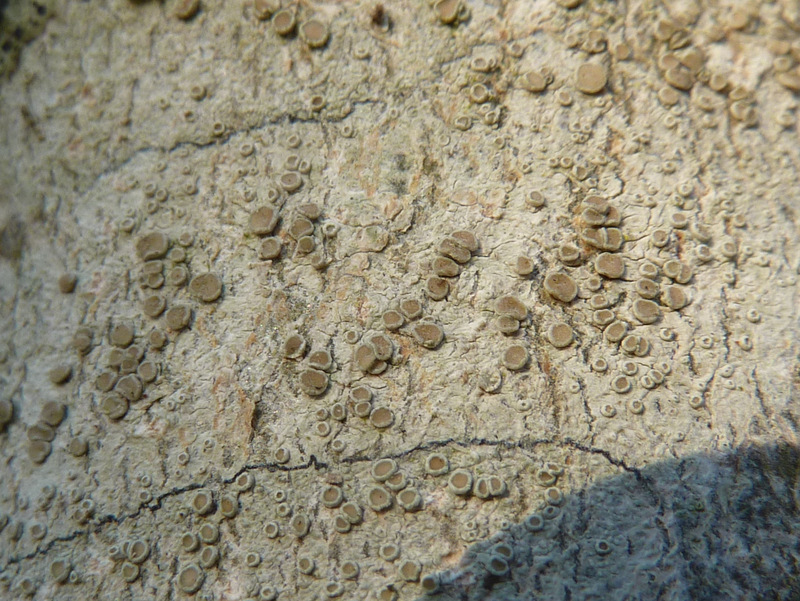 These are where the spores, the reproductive seeds of the lichen, are produced. 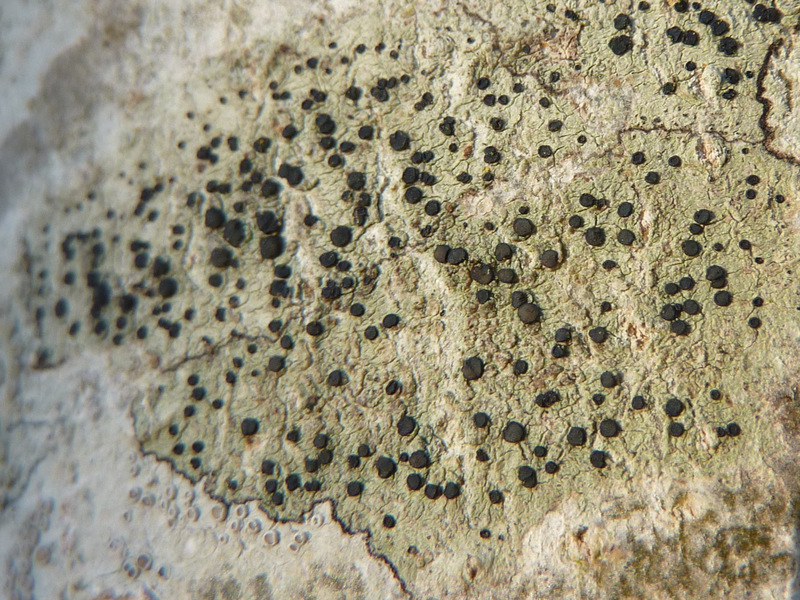 Leacanora are crusteose lichens and are another fairly common group of species which you are likely to come across. This one is differentiated from the very similar Lecanora chlarotera by the colour of the fruits which are white rather than buff. Again, you can see the jam tart like fruiting structures and you can see the difference between this crusteose lichen and the much leafier foliose Xanthoria parietina. You might have to look a little more carefully to spot this one, another crusteose species. Depending on the tree you find it on, it may only be the black fruits which give it away – these are often called wine gum fruits. If you look carefully though, you’ll see plenty of established specimens of this lichen on the ashes throughout the plantation, as well as tiny patches which are only just beginning to establish and where only a few black dots are apparent. Tree identification in the winter isn’t so difficult as you might think! Broadleaf trees lose their leaves in the autumn and develop buds which remain throughout the winter and these make it very easy to work out which species is which. The Woodland Trust have produced a very handy guide to some of the most common species which shows photographs side-by-side for comparison. If you want to identify them in a little more detail, this little booklet is invaluable and provides a few more diagnostic characteristics such as the architecture and bark types. It even has a handy key which takes you step by step towards the correct identification! Of course, one drawback of relying on the buds to identify the tree is getting to the buds in the first place, which can be a long way off the ground depending upon the tree in question. So Londonthorpe Woods seemed like an ideal place to begin. Londonthorpe Woods is located just off Londonthorpe Lane as you leave Grantham to the north-east. The wood was created by the Woodland Trust who planted thousands of trees on the 56ha arable site between 1993-1995. 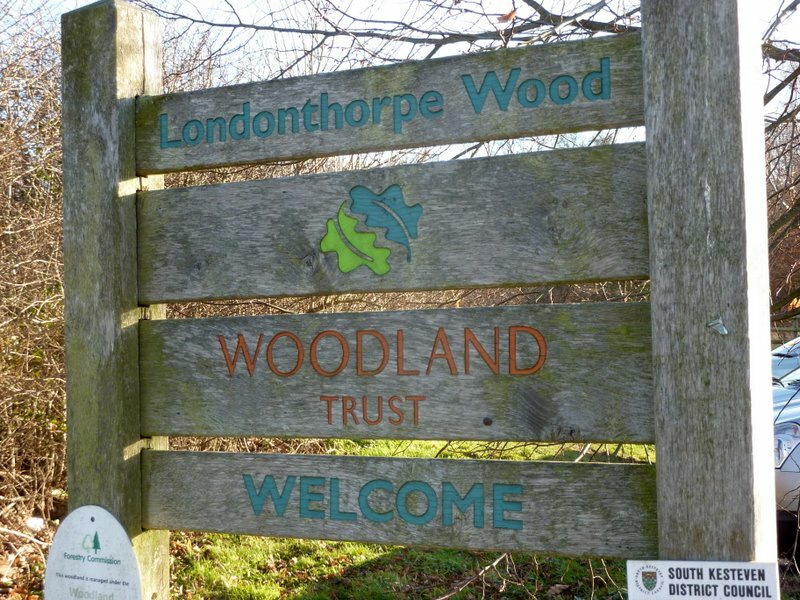 The Woodland Trust continue to own and manage the site. As the site is so large, I concentrated on the first area you arrive at if you step through the gate from the car park. This area has been planted with a number of our native species which will one day develop into a woodland much more natural in character than it may appear at present. Alder (Alnus glutinosa) and willow (Salix spp.) will grow quickly but remain smaller, as will the silver birch (Betula pendula) and cherry (Prunus spp.). The English oak (Quercus robur) on the other hand will grow slowly and steadily to rise to prominance above the canopy one day, with ash (Fraxinus excelsior) close behind. Finally there are hazel (Corylus avellana), hawthorn (Crataegus monogyna) and blackthorn (Prunus spinosa) shrubs which will form an understorey, along with dog rose (Rosa canina). 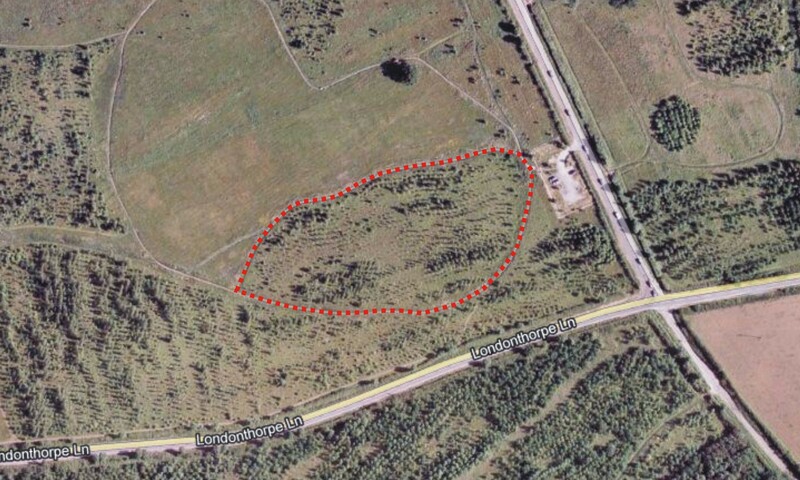 Map of the plantation behind the main carpark of Londonthorpe Woods (courtesy of Google Maps). Each of the species is described briefly below, along with a photograph of the buds to show you what to look for! Click on any of the photos for a larger image. Alder buds are red and vaguely conical and remain quite close (appressed) to the stem. 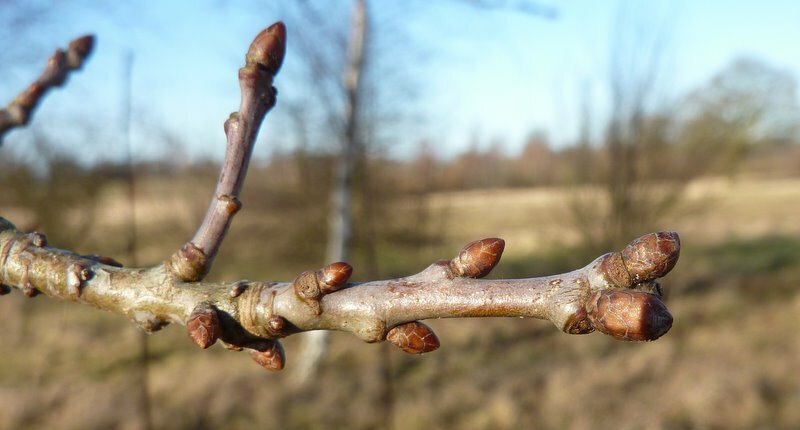 They are alternate – each bud is present as an individual rather than a pair and they alternate as you look along the twig, one to the left, then one to the right. 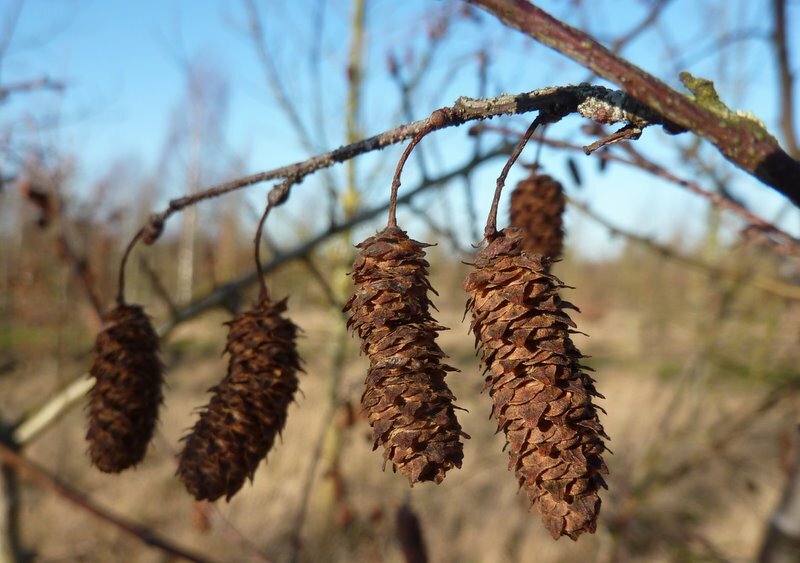 Alder is one of the more helpful tree species in that it often provides extra clues in the winter – the cones are generally present right through until spring time. Willow’s are a variable bunch and as well as having several species native to the UK, they hybridise so there is even greater variety than you might expect. 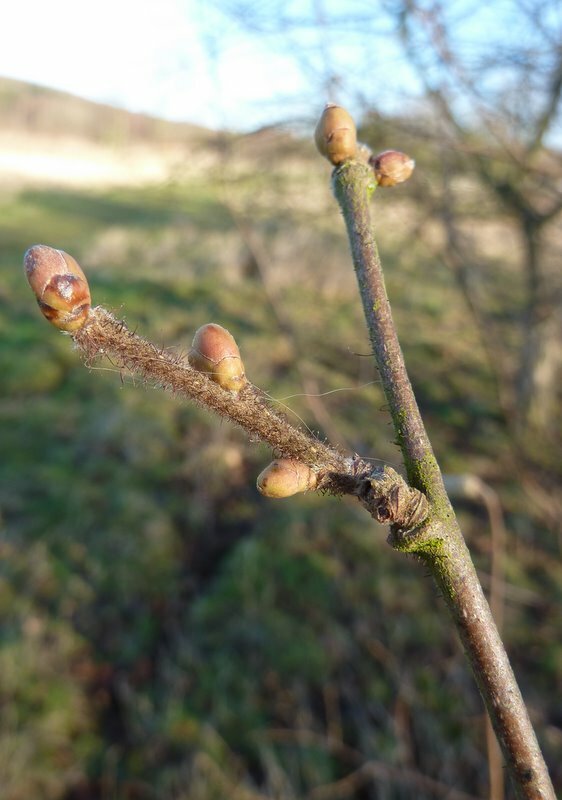 I think that this example might be goat willow (Salix caprea) – it will be easy to check when the buds break – goat willow produce fantastic flowers so watch this space! The buds are alternate again, lime green with redness towards the tip. The presence of both the willow and the alder in this plantation suggests that the ground may be damp – both species are most commonly found along river banks or in other damp conditions. Like the hazel (see below for more details), the willows have been coppiced in this site. Now this is a species which few will need the buds to identify – the distinct silver banded bark is visible behind the buds in this photograph! The buds themselves are alternate and on small stems which protrude from the main twig. 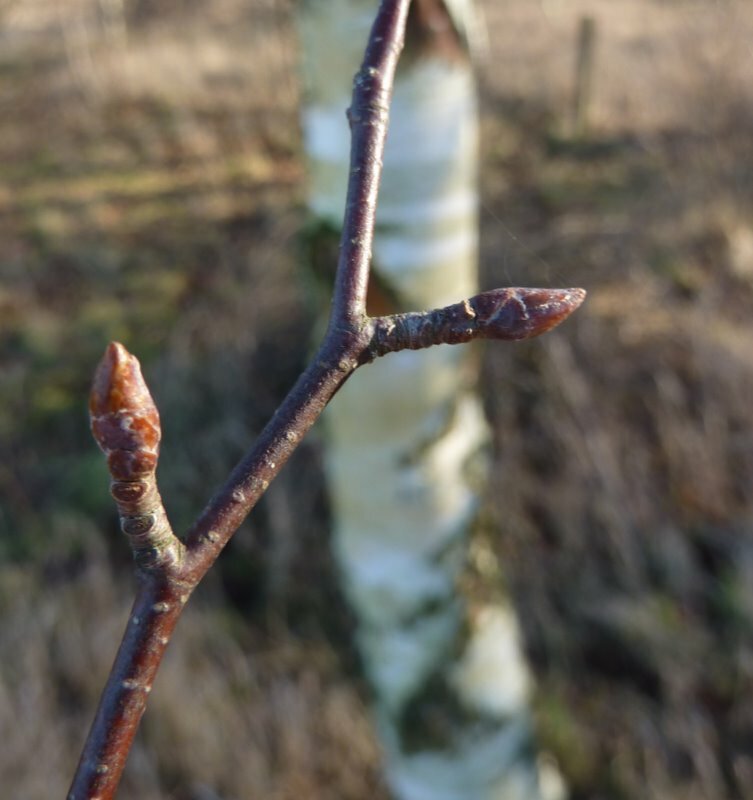 Silver birch grow quickly but are relatively short lived – they are often one of the first pioneer species in a new woodland but soon become out-competed by larger, taller trees. Cherry is another difficult species as there are so many ornamental and hybrid varieties to choose from. The buds are alternate and dark brown with scales visible. Cherry is another species where the bark is very useful in the winter – the lines which look almost like horizontal cracks in their shiny bark are called lenticels and these are quite characteristic of cherries. Although it is difficult to be sure of the exact species, it is likely that the Woodland Trust would have planted one of the native varieties – wild or bird cherry. Of the two, this one looks more like wild cherry (Prunus avium). Again, we can return to check this in the spring or summer! The oak has tight clusters of buds especially at the tips. The buds are brown and have lots of scales. One day this tree will probably tower above the others – think of the Major Oak in Sherwood Forest. For an example closer to home, there is a beautiful mature oak specimen along Belton Lane which you will probably pass on your way to Londonthorpe Woods – more on this magnificent tree in a later post! The ash has one of the most distinctive buds – they form jet black pointed cones which really can’t be confused with much else. If you find buds of a similar shape but a different colour, such as grey, think of one of the other ashes which we sometimes encounter such as manna ash. 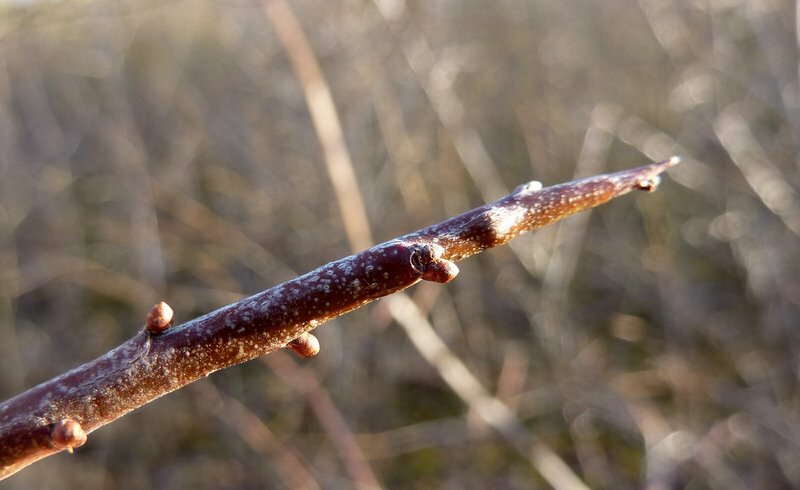 Hazel buds are a greenish red in colour – a little like a red and green apple. They are alternate along the twig which itself is often hairy. 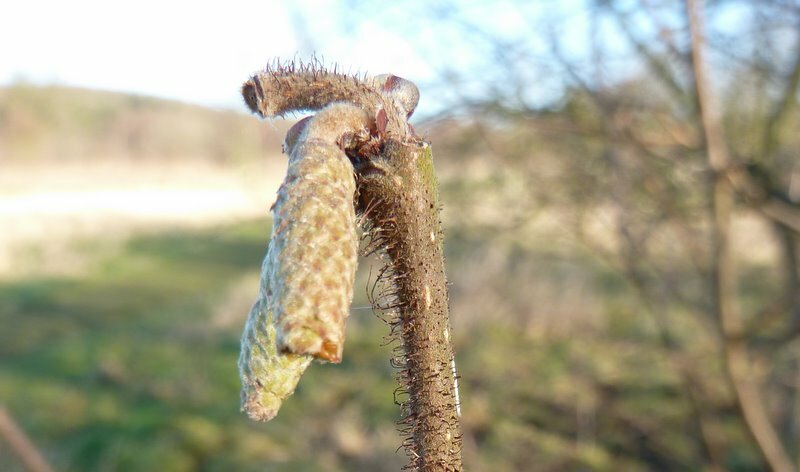 Hazel provides a few extra clues in the winter time – the catkins (the male flowers) are often visible and if you look very carefully, you can see the tiny red female flowers on the same branch. Another clue, depending on the management, is the growth form of hazel. It is often coppiced – that is cut down to the ground – and from here it sends up lots of new shoots which are often allowed to grow for several years before being cut back. The hazels in this plantation have been coppiced. The spiky shrubby hawthorn bush is fairly distinctive, even in the winter time. The spikes are generally quite visible and the buds compete with these along the twig. 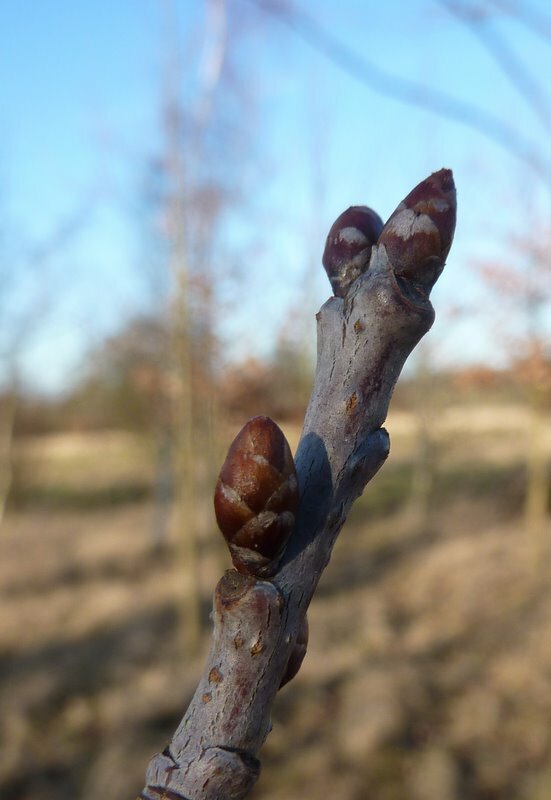 The buds are alternate and a similar dark reddish colour to the twigs. Blackthorn buds, by contrast with the hawthorn, are tiny little red dots which appear along the stem. The twigs are often long spikes and the buds appear along these. The colour of the bark of blackthorn is, as you might imagine quite dark, a blackish grey perhaps. Another species which you are unlikely to confuse with many others. Native roses grow lower to the ground than the other species in this plantation but can develop quite a shrubby form. 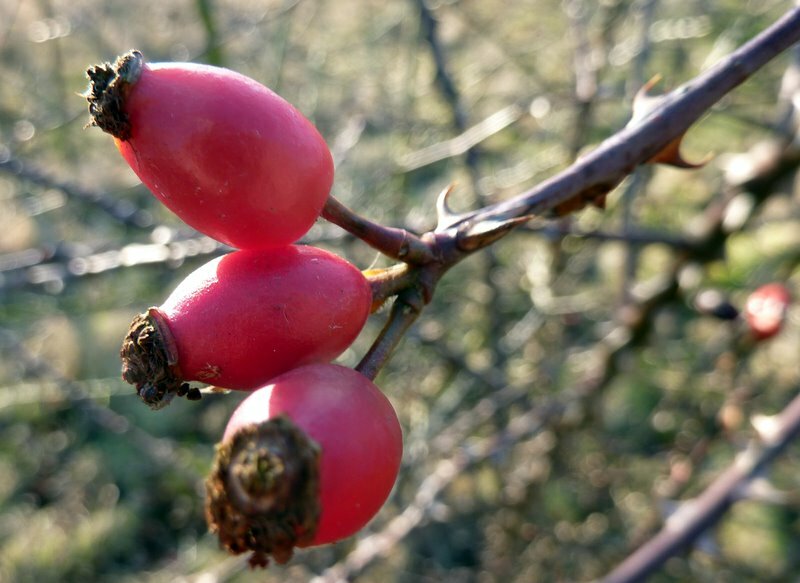 The curved rose thorns, like a hawk’s talon, are quite distinctive and the rose hips, still present in January, are another key clue. The buds themselves are a slightly lurid red and grow alternately up the twig, alongside the thorns.